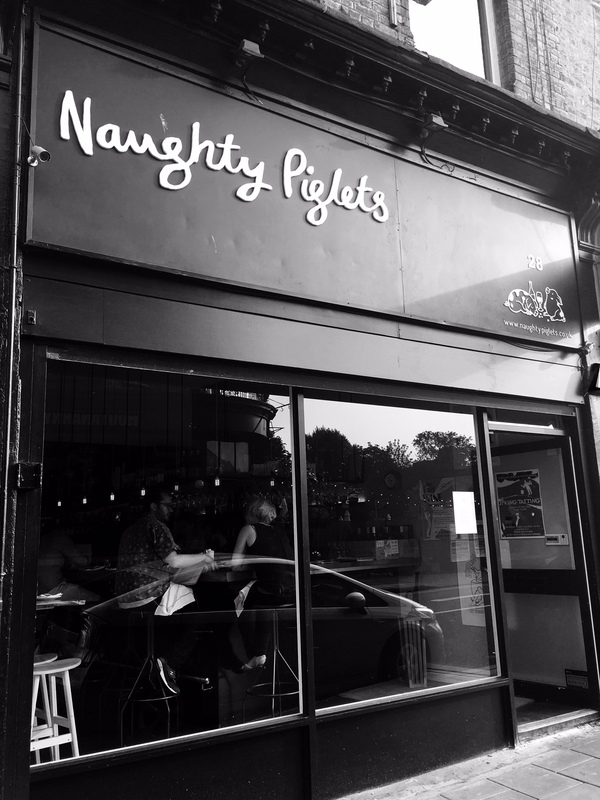 Margaux Aubry and Joe Sharratt can proudly claim to be part of the new foodie wave of restaurants opening up in Brixton with their cheekily named charcoal grill and natural wine bar, Naughty Piglets. Christina Rasmussen went along to find out what the fuss is about. 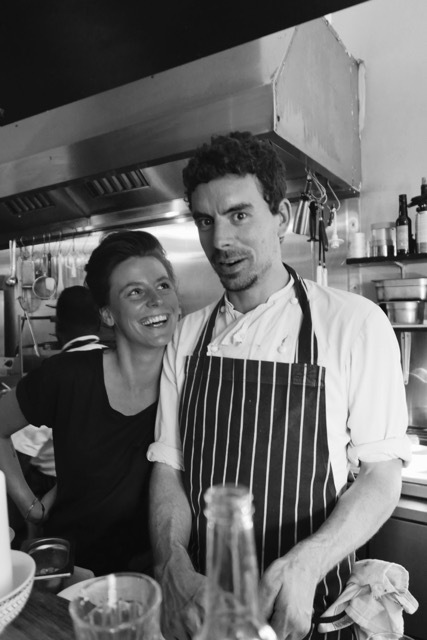 Margaux Aubry and Joe Sharratt have quietly taken the best of what they learnt from their time at Trinity and Terroirs and re-invested in Brixton’s Naughty Piglets. Tucked around the corner down the road from Brixton station, past the infamous Hootananny, lies Naughty Piglets. Unassuming and neighbourly, the little restaurant has bare walls, naked bulbs and minimalist décor, plus a couple of natural wine posters. Here, it is all about the food, and most of all – the wine. 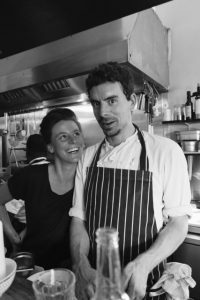 Set up by Margaux Aubry and Joe Sharratt, the ethos of the restaurant is to provide fresh sustainable produce, and first and foremost natural wine in all its guises. 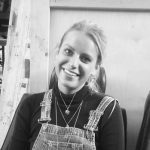 Before Naughty Piglets was born, Margaux worked at Trinity in Clapham (where Joe was head chef), and then at Terroirs, which we know to be arguably London’s home of natural wine. Two little rusty piglets sit on the bar, along with candles and a vase full of corks of, no doubt, some exciting, unusual and rare wines. For natural wine enthusiasts, the list is to die for. 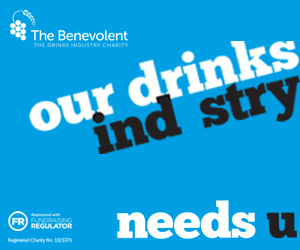 The bar staff are friendly and chatty, and it has a very convivial atmosphere. The place gets booked out quickly and it’s only little – so reservations are key. Thankfully Aubry found some time to talk to the Buyer about the Naughty Piglets story. So how did the Naughty Piglets concept star? What’s the inspiration for the name, and how did you come across the space? We saw a lot of sites south of the river as it was always a question of being somewhere in south London. We fell in love with what we have. It is the perfect space and location for the right money. As for Naughty Piglets? Well, Joe always says that I’m a greedy pig when it comes to food and wine! We think Naughty Piglets is a state of mind. We want all our guests to eat, drink and be happy like a naughty piglet. Voilà! Where does your love for sustainable produce come from? It’s because we care. We like to work with passionate people that care about the product more than anything else. You have a strong focus on wine, and particularly natural wine. When did you start having such an interest in wine and how did you get such a specialised knowledge of natural wine? I’ve been in the wine industry for six years, simply love it and drink a lot of it. I have nothing against conventional wine, I just get more excited by natural wine as you never really know what you’re going to get as they are ever changing. Meeting and getting to know these winemakers that put so much work, dedication and love into their wine is a big part of it too. 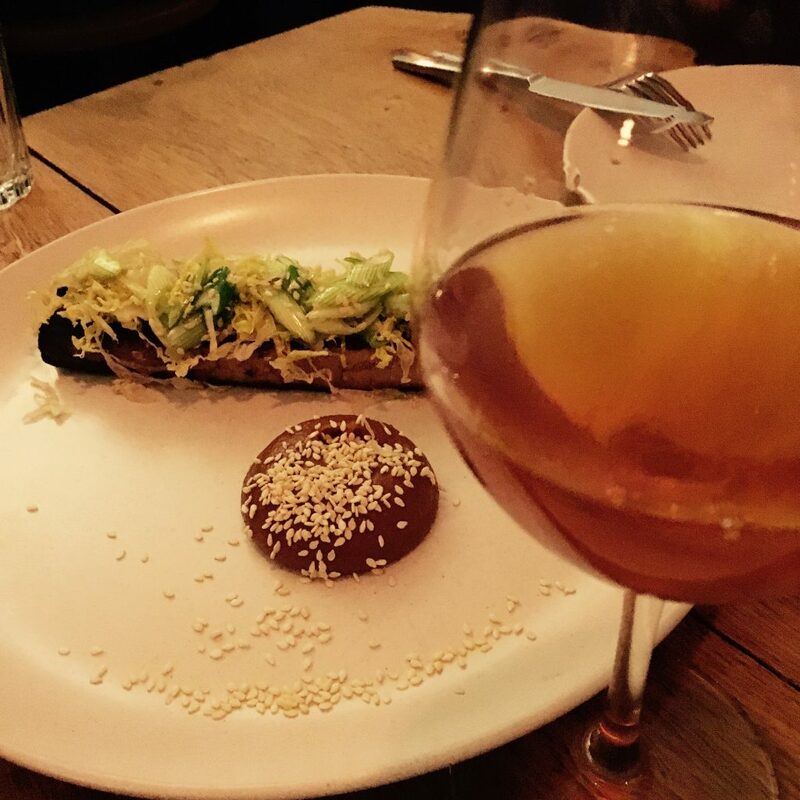 Natural wine is having its moment in London finally. 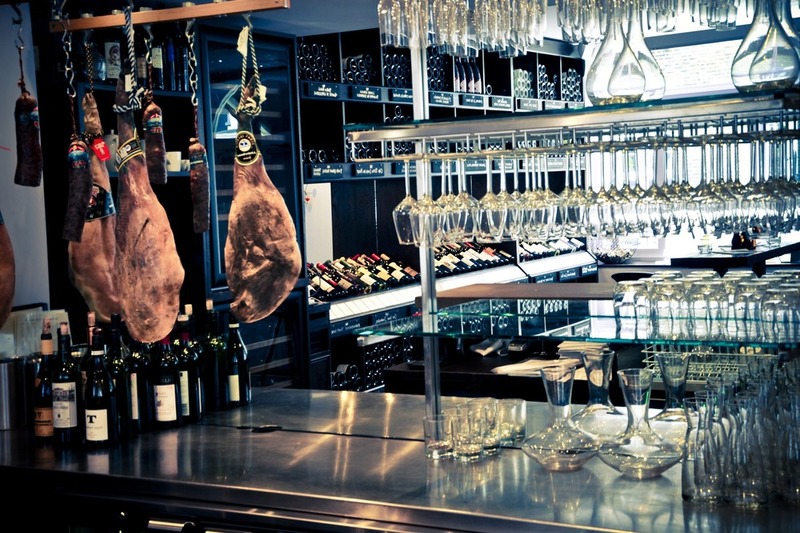 Do you have a lot of consumer interest particularly because of your wine list? A lot yes. 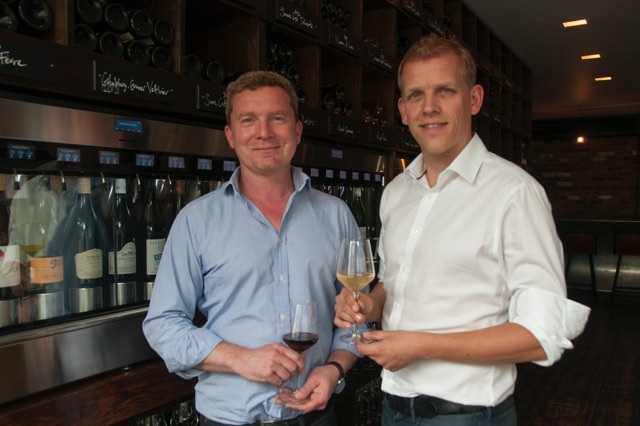 Natural wine has been in London for over 12 years now, starting with the wine bars Terroirs and Antidote. People are definitely more and more interested and really get excited about it. 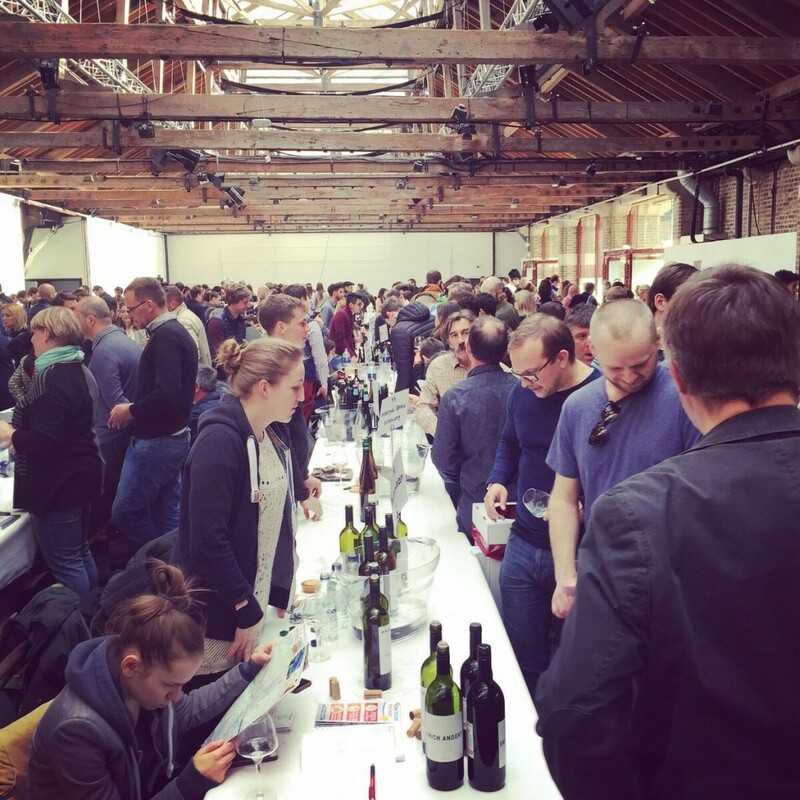 What do you think is in store for natural wines in the UK? I think it is going to take over. 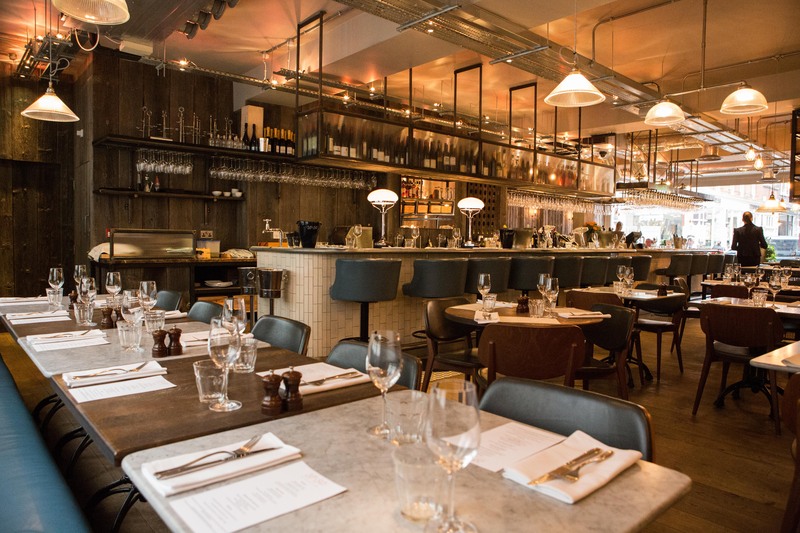 All of the great restaurants on the scene in London sell natural wine and the demand keeps growing. Which suppliers do you use for your wines and why? Most of our suppliers have became friends over the years and again they are ones which are all working with the same philosophy of caring for the product, as well as for the environment. So we use mainly Tutto, Les Cave de Pyrene, Dynamic, Vinetrail and Gergovie. 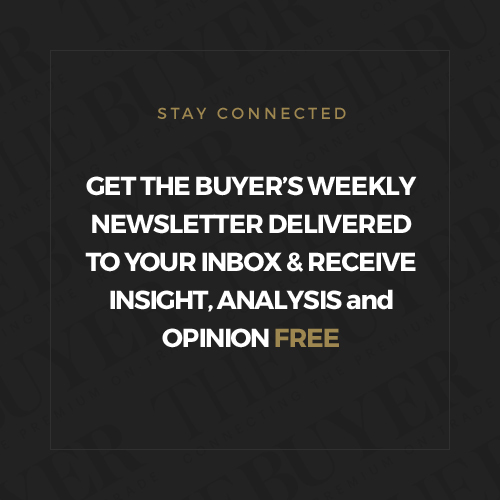 Do you ever buy directly from producers? Unfortunately not because of taxes and duties. We do sometimes but that is more for our personal consumption. Do you also sell beer and spirits, or cocktails? If so, what do you sell, and why? Yes one beer on draught and a lot of spirits, with just a few cocktails (Negroni, gin and tonic, vodka and tonic, Americano and Bloody Mary). We follow the seasons, so each time a new ingredient comes in to season we will follow that. Or whatever our fish supplier has caught the day before. How often do you change your wine list? The wine list is always growing , we have over 200 wines and there are new listings each week – it comes and it goes! Which wines on your current list would you say are must-trys? The wines from Savoie especially. What’s the most unusual wine on your list? “French wine is not dead” from La Sorga and all our orange wines. (“French wine is not dead” is produced in Languedoc, by Antony Tortul, a Rastafarian from the Rhône Valley, living and working in Béziers. His wines are natural, minimal intervention wines, many of which are organic and biodynamic). The food at Naughty Piglets is best enjoyed shared. Small dishes of all forms are served, with a recommended five or six between three for example. Pre-dinner, I enjoyed the sparkling Gamay, the 2015 Pet Nat ‘Pink Bulles’ by Jean Maupertuis, from the Auvergne. Jean Maupertuis, also the winemaker, prunes, tills and cares for his organic 3.5 hectares all by himself. It is a blend of 50+ year old d’Auvergne Gamay and Gamay. The 2015 Pink Bulles is delicate, with a slightly floral nose, and an element of blossom, as well as notes of strawberry and fresh raspberries. On the palate, it has weight and is very round, with good acidity running through. Slightly sweet. It’s the ideal pairing for their ham and cheese croquettes that serve as pre-dinner nibbles, which are big balls of cheesy goodness. Arguably actually the best croquettes I’ve had in London. For our mains, we had the 2013 Pamhogna Weiss, Andert-Wein, Austria, from local grape varieties. This has a confit orange, lemon peel and pineapple nose. Rich, spicy aromas on the palate, particularly reminiscent of Christmas spices. Well integrated acidity, keeping this big orange fresh. Farmed biodynamically since 2003, the work in the vineyard is crucial for Pamhogna. I’m all for orange wine. In fact, I’m fanatic about them – I’m always on the lookout for new ones. I find them to be perfect food wines, and knowing that Naughty Piglets cooks with a wide range of flavours, we chose this one to accompany our food. 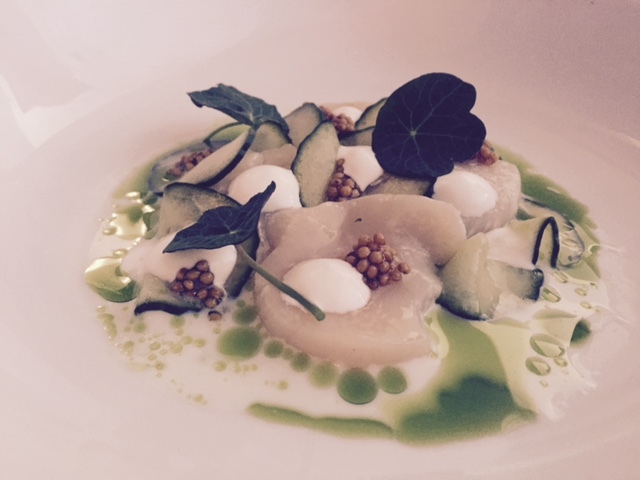 Cured scallops, horseradish, dill & cucumber. Delicious, not a single thing to fault. I’ve never tried horseradish with scallops before but the two compliment each other perfectly. The rich, buttery scallops benefit from the fresh zing of the horseradish. Furthermore, it’s a really good pairing for the orange wine. Big flavours all around can bounce off each other. 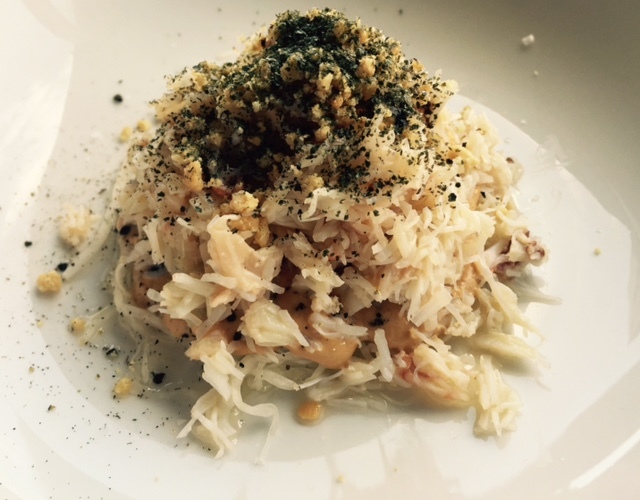 – Devon crab, peanut and pickled cabbage. Extremely good quality crab meat; fresh and straight out of the sea. The peanut gives added weight, and the pickled cabbage adds to the fresh side. – BBQ pork belly, sesame, Korean spices. My favourite. A pork belly fan anyway – this is actually top of the ones I’ve had here in London. The sesame and Korean spice adds to it and makes it less heavy, instead promoting Asian flavours through. It’s the ideal pork belly for summer. Perhaps the best pairing I’ve had for an orange wine. For pudding, I had the chocolate mousse with salted caramel and the 2013 Côteaux du Layon, Domaine Ogereau, St Lambert Chenin Blanc. This had plenty of candied orange peel, nutmeg spice and honey. Lasts forever on the palate, and dangerously moreish. I have read that apparently, Vincent Ogereau plays music to his wines whilst they are maturing in cask – well, if he is – it’s working. 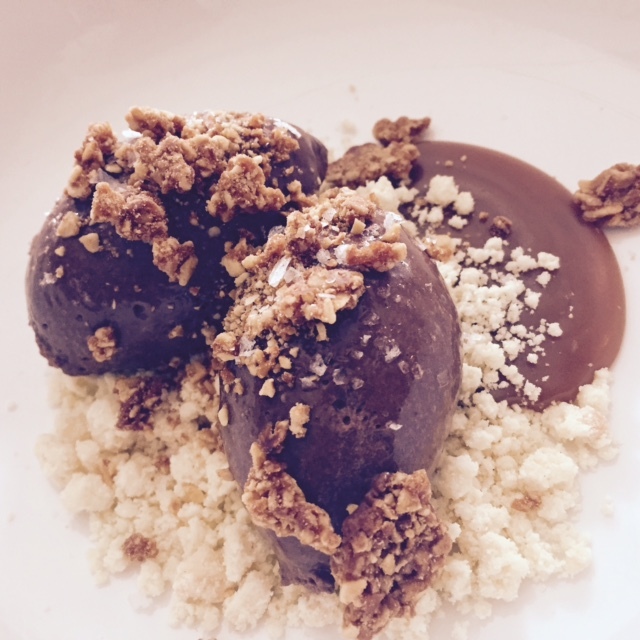 The mousse was pretty perfect – rich but not sickly, and salted caramel is always a winner in my eyes. Literally a match made in a piglet’s heaven. Naughty Piglets is at 28 Brixton Water Lane, SW2 1PE, 020 7274 7796.